What is Home loan GUARANTOR? A Guarantor is a person who can guarantee the re-payment of loan amount in case something happens to you i.e. death or any other disability. This means that if you default in paying back the loan due to any reason whatsoever, the bank will pass on the liability to the guarantor. Guarantor is liable to pay back the remaining amount of loan. An interesting point to note here is that almost all public sector banks like SBI, PNB etc. have this as a mandatory requirement to give you home loan. Whereas private banks do NOT even ask for it. They are okay with your salary slips and other income proofs. Who can be a Home Loan GUARANTOR? Anybody who can vouch for you can be guarantor. Normally they ask for a person from your family, but your friend can also be your guarantor. What documents are required from a GUARANTOR? A guarantor needs to submit his income statements to prove that he/she is capable of paying back the loan amount in case the person in question defaults. Normally, the salary slips and other income proofs like PF, any existing property proofs (photocopies) are acceptable. In today’s world, it is really difficult to find a person who would like to be your guarantor. Nobody wants to inject an unnecessary tension in his/her mind by signing legal papers for you. Who knows, you may default tomorrow and why should anybody pay in case you default? Ask yourself, would you sign a guarantee for anybody? Even parents ask their children to do it on their own as they also do not want to carry their child’s loan burden. Well, I was the one who did not had ANY guarantor whatsoever. This meant that even though I had all the papers in place and was eligible for loan, i could not get it just because I did not had a GUARANTOR!! 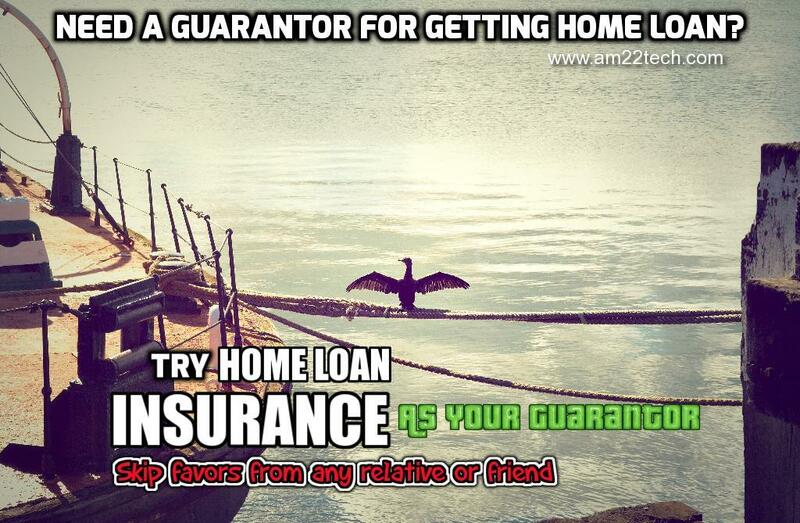 I had lost all the hopes until i got to know of an insurance policy which could act like a GUARANTOR for me! This policy is called Loan insurance policy and is offered by almost all banks/insurance companies these days. What is Home Loan Insurance Policy? An insurance tied to your home loan EMI payments meant to safeguard bank’s investment in giving you home loan. The insurance company takes on the burden of re-paying the loan to bank in case something happens to you. The amount of premium is calculated based on the tenure (total months) of your loan and the amount that is insured reduces with each EMI payment made by you. The policy acts as a guarantor for you in case you don’t have any. I preferred buying this policy instead of requesting people to vouch for me. I feel that it is much better to depend on yourself than somebody else!! 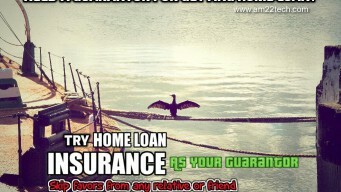 Benefits of Home Loan Insurance Policy? The biggest crisis and pain that your family faces in case something happens to you is the loss of a beloved one. This pain is increased if the bank comes to your doorstep to ask for EMI’s and the pain is even more when you get to know that the home which you bought is actually mortgaged with bank and hence can be sold by bank to recover the outstanding loan. The home loan insurance provides a big relief in this situation. The insurance company will pay back the outstanding loan to bank, bank will release the mortgage and will transfer the property on your family’s name. Also, the premium amount that you pay is for the full tenure. In case you prepay the loan and close it before your actual tenure, home loan insurance company returns the unused premium back to you. But this is generally a small amount as per the terms and conditions of the policy. So, apart from being a guarantor, it helps you LIVE and reach heaven tension free. The premium is different for each case. You have to contact the insurance agency to find for you. The lowest rates are offered by government banks like SBI. Thanks for your wonderful info throughout. I have took SBI home loan almost 11 months back but I didn’t took Home insurance just by having a thought that I would have to pay that chunk amount for insurance. But now thinking of that was my mistake I should have took insurance, so If I have to take insurance now will it be permissible under SBI MaxGain loan OD account. Please let me know any of your inputs on this. Home loan insurance and home insurance are two different things. 1. If you have taken home loan, SBI would have already got the HOME INSURANCE premium deducted from your loan amount. Check the OD account statement and you will find the premium deduction in first month itself. 2. If you are talking about home LOAN insurance, then I think you can take it anytime. It is just an insurance to protect your home loan repayment in case of any mis-fortune. Your family or dependents would not be burdened by the home loan payment in case something happens to you. This insurance will pay the whole amount. 1) As far as HOME INSURANCE premium concerned I could not see whether its been deducted or not. I could only see CERSAI charges and Processing fee got deducted. 2) Regarding Home Loan insurance will it be one time payment? For that do I have to approach RACPC of SBI or I can avail it from outside. Are these HOME INSURANCE premium & HOME Loan Insurance separate entities. Your suggestion on this!! What you have done in your case..? 1. For me, it was deducted in first month of loan. You can probably ask your branch for more information. No bank gives out the home loan without the HOME insurance. 2. Yes, you can take this insurance from SBI. The same person who helped you with SBI loan (bank representative) can help you with this insurance. For me, the same person did everything. You have the option of paying one lump sum premium in one shot or can take the option of paying it yearly. For me, I paid the premium of 65K in one shot for a loan of about 20 Lakhs. Almost all banks who provide the home-loan insurance. You can search for a better rate and then take the policy. I would say SBI insurance rates are quite competitive. Will check it out… I have took SBI loan only but need to check on insurance part. i was looking for this info..thanks for this article…. 1: You should vastly improve on your grammar. There are many typos. 2: You should double check what you have written. E.g. At the end of second paragraph appears this sentence: “We will not talk about these expenses in detail in another article.” I would like to what exactly you meant. 3: List names and institutions that offer this kind of insurance/facitlies. I guess rest looks fine. Thanks a lot for your response. And yes i agree with you, i have made many mistakes as yo have pointed out. I will get it reviewed and improve the grammatical mistakes before publishing the article. And yes, regarding the the Home loan insurance providers, almost all insurance companies these days provide this kind of insurance. And to be specific, i got it from SBI life insurance for my home loan and they are preferred insurance partner if you take home loan from SBI itself. SBI life insurance can insure other bank’s home loan too. Just check with your bank and they would be able to guide you. In case you have any specific requirement, please do let me know and i will try to find more information about it.